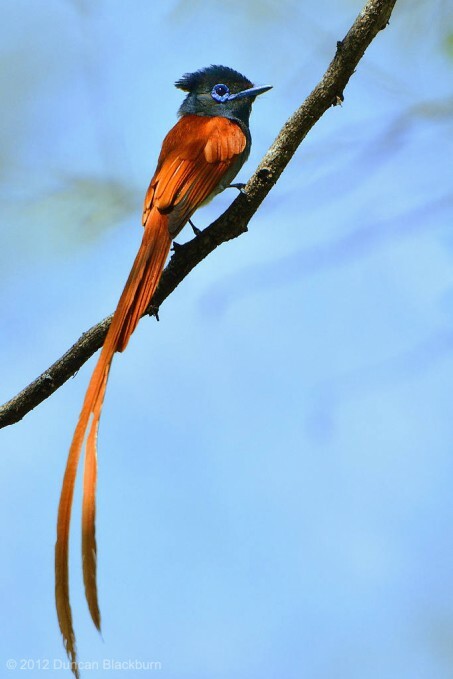 The African Paradise Flycatcher is a common resident breeder in Africa south of the Sahara Desert. This species is usually found in open forests and savannah habitats. Two or three eggs are laid in a tiny cup nest in a tree. The adult male is about 17 cm long, but the very long tail streamers double this. It has a black head, neck and underparts, and chestnut wings and tail. There is a prominent white wingbar. The female has a browner tint to the underparts and lacks the wingbar and tail streamers. Young birds are similar to the female but duller. The males show considerable variation in plumage in some areas. There is a morph of this species in which the male has the chestnut parts of the plumage replaced by white, and some races have black tail streamers. The African Paradise Flycatcher is a noisy bird with a harsh scolding call. It has short legs and sits very upright whilst perched prominently, like a shrike. It is insectivorous, often hunting by flycatching. This image was captured close to the Phabeni entrance gate to the Kruger National Park, South Africa.